Below is the schedule for associations working the Honey Booth at the State Fair. Thursday, Aug. 16: Bluegrass Beekeepers Association. Friday, Aug. 17: Bluegrass Beekeepers Association. Saturday, Aug. 18: Oldham County Beekeepers Association. Sunday, Aug. 19: Shelby County Beekeepers Association. Monday, Aug. 20: Allen County Beekeepers Association. Tuesday, Aug. 21 (morning): Capitol City Beekeepers Association. 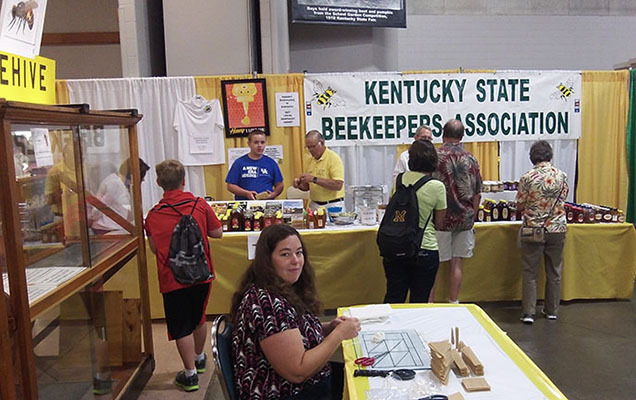 Tuesday, Aug. 21 (afternoon): Kentuckiana Beekeepers Association. Wednesday, Aug. 22: Mammoth Cave Beekeepers Association. Thursday, Aug. 23: Grayson County Beekeepers Association. Friday, Aug. 24: Audubon Beekeepers Association. Saturday, Aug. 25: Green River Beekeepers Association. Sunday, Aug. 26: Oldham County Beekeepers Association.